This mechanical singing bird cage has two tiny imitation birds that move in time to the bird song whistle. Both birds move their tail & beak and one also moves its head as it plays. 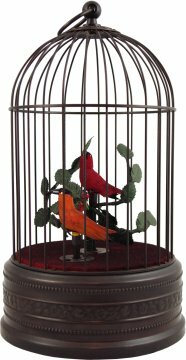 Made to old factory patterns in Germany this all mechanical activated bird cage is an exquisite piece of craftsmanship. The whole cage & birds are finished in a dark antique wash to give an "aged" look for authenticity. All clockwork driven movement made in Germany to old factory patterns.